Sometimes leopard seals can be very curious and friendly. Check out this video of a Lep following Jen and Kristen into the parking lot as they finish up a day of counting penguins. Enjoy ! 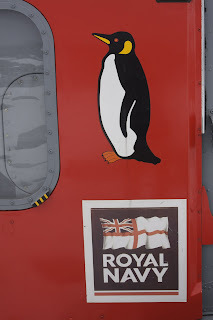 Some of my favorite things in Antarctica are the penguins. In every way, these birds are so full of surprises and contradictions. On the one hand, they look and sometimes act like soft and pudgy stuffed animals. On the other hand, they are amazing athletes - stunningly efficient at swimming and flying. Wait, did I just say 'flying' ?? Well, penguins sometimes do fly - or at least glide. Its called porpoising. Penguin's wings are meant for water, not air, and their dense bones would make true flying very difficult but these birds do get their air time. Just hang around a swimming penguin a little while and you probably see it leap out of the water, soaring in a graceful arc before plunging into the water again. Scientists and others have argued about the purpose of the leaps. 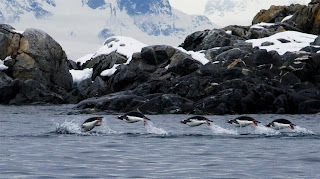 It enables the penguin to breathe without slowing their swimming speed, so maybe they do it to get a good breath of air. But, penguins don't porpoise very often (usually only for a few minutes at a time), and they can hold their breath a long time, even while swimming hard, so easy breathing isn't the whole story. Another possibility is that penguins porpoise to conserve energy. Because penguins have to come to the surface to breathe, they travel close to the surface. But swimming in that boundary layer - defined as 1 to 3 body diameters under the water - creates a lot of drag. Because air is so much less dense than water, gliding through the air from time to time gives the penguins a little break. One more explanation (and the one I favor) has it that porpoising penguins are on the lookout for predators like Orcas and seals. Leaping in and out of the water makes them a tough target. 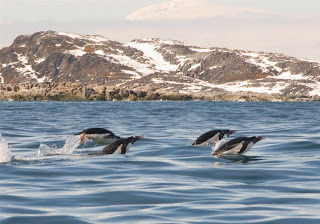 Whatever else it is, leaping out of the water is a social activity, usually I see a whole group of penguins, ten or twenty or more, porpoising in time with each other. And, for anyone who wants more, this paper by Japanese researchers describes tagged Adelie penguins. I've been asked to say more about what life on station is like: what we do in our free time, how our days go. Well, here's how it went in November. Our work week is 6 days, Monday through Saturday, from 7:30 am until 5:30 pm. My work time is spent servicing the 13 geophysics experiments running here. After dinner, many people play cards, watch movies or work out. As luck would have it, November sported quite a bit of bad weather so there wasn't much recreational boating or frisbee. Here was a typical weather forecast: "22 November - Regional Weather Summary - A deep low in the eastern Bellingshausen Sea continues to dominate the region. Expect plenty of precipitation and gale force winds. This low's life looks to be coming to an end by mid-day Monday but don't worry. The next major system will move into the eastern portion of the Bellingshausen Sea by mid-day Tuesday with plenty of more bad weather." We manage to have fun community events and celebrations pretty frequently. In November there was Halloween (November 1), Doc Pat's birthday, an exhibition of Scott Sternbach's photographs and an open mic concert in the boat shed. Of course Thanksgiving was huge. Most people helped make stuffing and pies and I think we had almost one pie per person. Before the dinner Phil bartended with a beautiful piece of glacier ice as his drink ice. 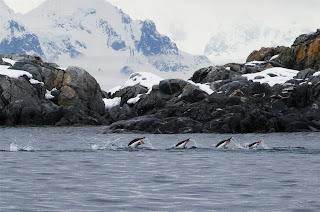 November starts the tourist season in Antarctica and it seemed like we had visitors every couple of days. First a party from the British Naval ship Endurance (mentioned before), with a BBC film crew in tow, dropped by to raid our stash of cookies and tshirts. Then, starting with the Kapitan Klebnikov, the cruise ships came by. The Kapitan Klebnikov is doing a one-month semi-circumnavigation of Antarctica and among their passengers is Alexandra Shackleton, granddaughter of the explorer. She's posing with Zee below. After the KK, National Geographic's Endeavor and the Ushuaia brought their passengers to also visit with us. Although very refreshing to meet new people, it's been somewhat disoriented to see a mass of yellow-slickered, cold-looking people led about station. Our last visitor of the month was the most exciting. 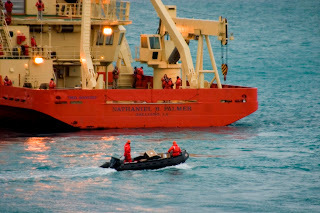 The Nathaniel B Palmer, the US Antarctic Program's other ship and big sister to the Gould had aboard laboratory supplies that we desperately needed here at station. 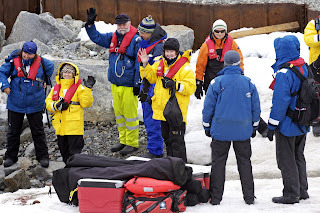 For some weeks she has been conducting ocean transects for the Antarctic Peninsula Long Term Ecological Research Group, and last week she was at her closest, just a few hundred miles from station. Braving high seas and wind that tested her ability to maneuver, the NBP pulled into Arthur Harbor, opposite station. Then started a curious play on Santa's sleigh. On station we loaded outgoing boxes - medical specimens, holiday gifts and science samples - into a zodiac. Piloted by a pair of guys who were about to get wet, the boat went out to the Palmer and returned with its cargo of Carbon 14 samples, laboratory glassware and 3-week old lettuce. I have never been more happy to see 3-week old lettuce. Wendy, genius that she is, actually had some artichokes and tomatoes slipped out to us as well.